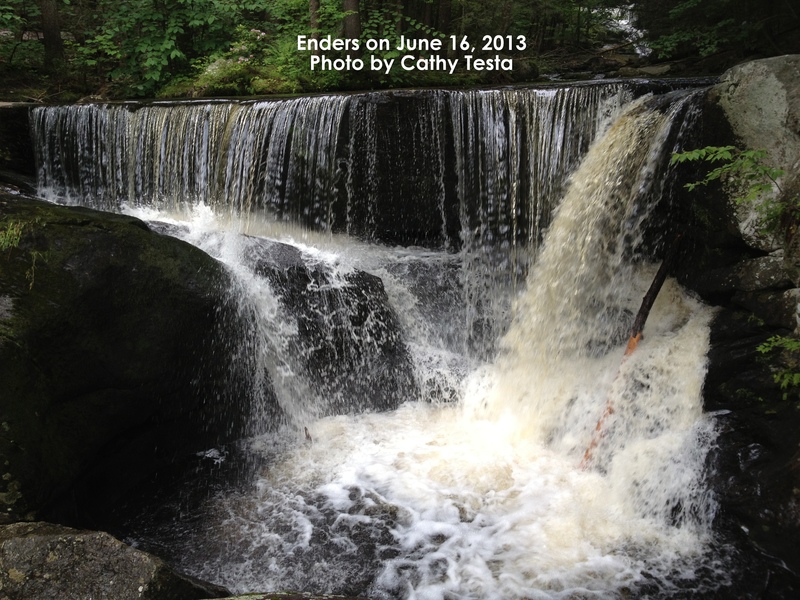 Visiting a walking trail in the woods always brings a bit of exercise and exploration of nature’s treats, yet this time when hiking Enders State Forest in Granby, CT last Sunday, there was heartfelt sadness for I recalled the recent reporting of a teen girl falling from the cliffs. It reminded me how dangerous it can be when walking this place. I slipped at the top of a cliff there last summer, but caught my balance. My husband said I practically gave him a heart attack. It is not a place you want to walk without being extremely careful, and perhaps with some professional experience as a hiker. I am usually the biggest wimp when it comes to any challenges along hiking trails, so it was a surprise to me too when I slipped, yet that memory plus the news of a loss of life at this park, made us all the more cautious as we took every step down to the slopes to view the waterfalls in several locations. 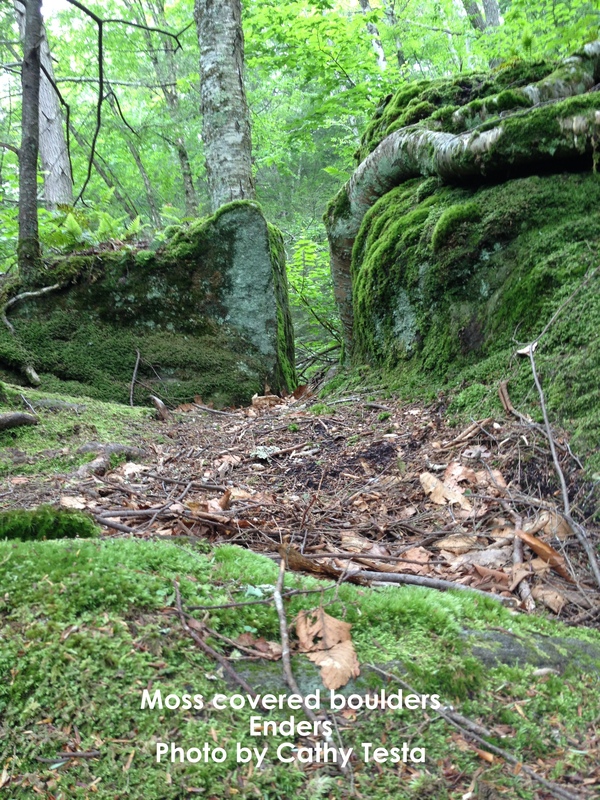 The recent rainfall in Connecticut has created not only roaring waterfalls at Enders, but a lush and full forest floor thriving with healthy ferns, mosses, and lichen clinging to the boulders and trees. It feels like an air conditioned room as you travel the paths through the tall trees. The mist from the waterfalls gently nourishes the plant life tucked in everywhere, between rocks, on decomposing bark, and from the ground. Soft cushy moss softens your steps in some locations and the sound of the rushing water is like a meditative force. In the summer, when the water is low and calm, it is a secret swimming hole too. And with a blanket and picnic lunch, this place offers tranquility with places to rest on the earth after taking your walk through the woods. Only a few other people were there the morning we went, one apparently a professional photographer with lots of gear and a helper to assist. Another was an elderly couple walking the trail, one with a cane. I wished I had taken a walking stick along myself. I wondered if they knew about the young lady falling recently, but I didn’t mention it. I wanted to say, be careful, it can be slick out here – I had a scare myself last year. I don’t know if I can ever go back “on the cliff” parts again, and certainly this could not be attempted with the rushing waters going over a steep precipice on this day following several heavy rainfalls. It surprised me after we finished our hike, and drove to New Hartford to see the Saville Dam and Barkhamsted Reservoir, a favorite of Steve’s, and had lunch at Chatterley’s in town there, how many locals have never heard of Enders Forest. Is it a kept secret? It IS a gem – a miniature Niagara at the moment. Funny how something literally around the corner, maybe 6 miles or so down the road, is an unknown to locals in New Hartford. 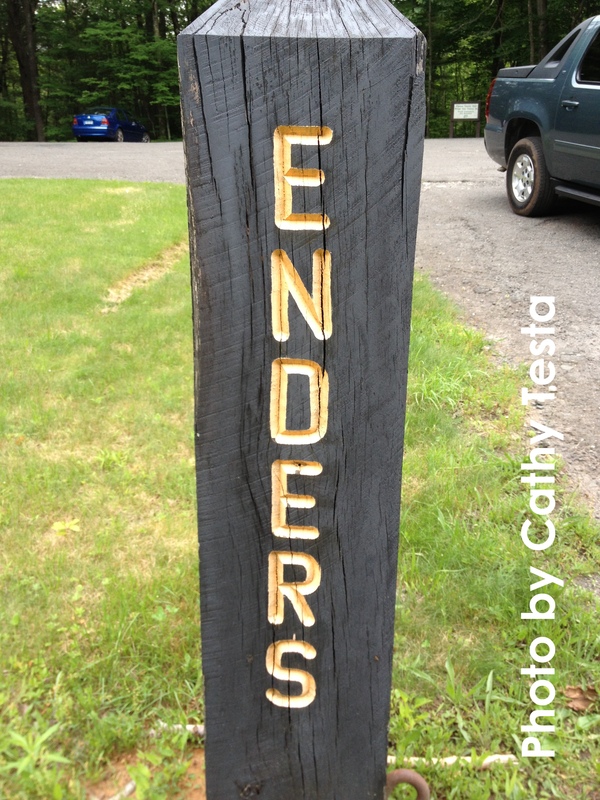 Enders State Forest in Granby, CT offers many treasures. It is truly an outdoor living room. To me, the forest’s natural plants, tucked among roots expanding and clinging onto the slopes and surfaces, are a favorite treat. It is seeing nature in its true form, being served by its surroundings of a natural environment, pretty much untouched. And the native Mt. 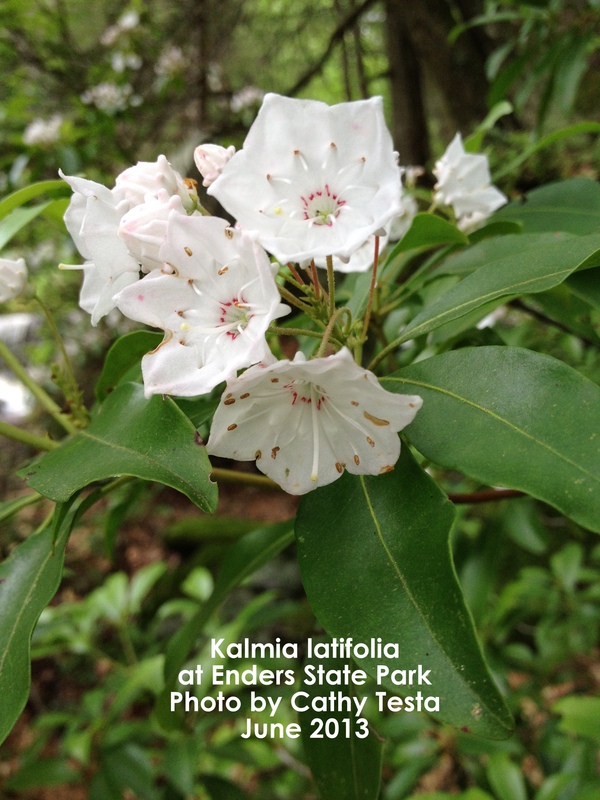 Laurel, CT’s State Flower, was in bud and bloom which was an additional bonus to going in June. I’m sure we will return in the heat of summer to cool off as well. And perhaps during the winter to see the ice on the waterfalls. BRING: Bring a walking stick, good hiking shoes are a must, lunch and a blanket. It would be nice if benches were in the park, but there are large bounders and places to sit as you watch the falls and enjoy the surroundings. Bring a suit if the water is low for the pooling areas. Don’t forget the camera. MOTORCYCLE: If you are a motorcycle lover, this is a great route for the bikers. Nice curvy roads, and some are recently paved, so smooth riding for you to enjoy. Normally we would have taken the Harley, but there was a chance of rain (like I said, I’m a wimp). 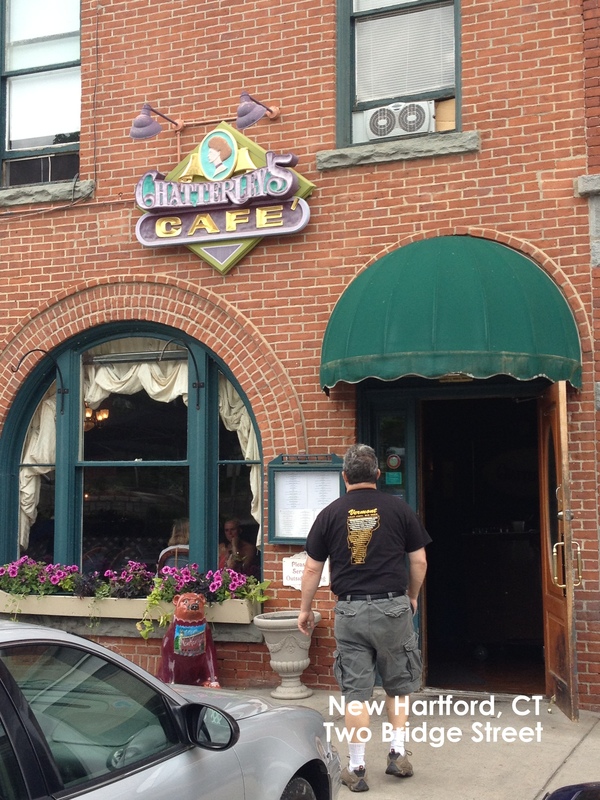 GO TO LUNCH: If you didn’t pack a lunch, go to Chatterley’s Cafe, take a left out of the entrance and head down the road to New Hartford, CT. It is located at Two Bridge Street, 860-379-2428. Great martinis and really excellent menu of appetizers, salads, fish, veal, chicken, and meat entrees. Food is very good. It was an old hotel apparently, you can see photos in the entrance, some famous people have visited this place – worth a stop. Right next to this cafe are some small and quaint gift type shops. SEE THE DAM: Before you go to lunch, of course, stop to view the Saville Dam and Barkhamsted reservoir. There is a huge wall to view the water from, and across from the building with the big wooden doors, is a round cement map surrounded by a fence, check it out – interesting. You have to cross the street to see it. There is a parking area next to the dam that is usually open during the day hours. USE CAUTION: And please, be super careful; when walking Enders. The moss on the ground can be slick, and the soft earth is deceiving if near the edge of a slope. But overall, it is definitely a nice place to visit for nature’s offerings. A true gift by the land donators – the children of John Ostrom Enders and Harriet Whitmore Enders, donated in 1970.